After iPhone X was introduced, people have tons of questions regarding the Face ID feature. It scans a face and unlocks an iPhone that belongs to a person. People wonder if they can unlock their iPhone X without using this feature and use some other features to perform that action. They also want to know whether it can be used for enabling Apple Pay or logging in to apps. Some of them are also interested if there are alternative solutions to this task, as not everyone wants to use Face ID. It's no matter what is your personal reason for not using Face ID (in fact, there can be a plenty of reasons). The good news is that you can actually get rid of it and use alternative options. You can use your new iPhone X without turning this feature on, and use other methods of unlocking and authentication. Today, I am going to explain to you how it can be done and answer some usual questions about iPhone's X Face ID. However, if you will still have some questions left, feel free to ask them in the comments section below this article. Is Face ID the only option for unlocking iPhone X? Can I use it without Face ID? This feature is not obligatory and is created just for comfortability of iPhone X users. If you don't need the facial recognition function, don't register with Face ID on your iPhone. However, if you don't do it, you won't have a chance to unlock your device by simply looking at it. But, you will need to enter your passcode, as it was usually done in earlier iPhone models. I'll tell you more about passcodes just in a moment. Can I skip Face ID? Is it optional? Yes, you can do this. If you want, you may skip the whole scanning process while you setup your iPhone X initially. Instead of using Face ID, utilize a passcode to unlock your new device. How can an iPhone X be unlocked without using Face ID? Any iPhone can be unlocked with a passcode. The same is about iPhone X. Pick up your mobile device, tap its screen, or alternatively, hold a power button. After that, swipe up the screen. It will take you to a new screen where you may enter your code and unlock your iPhone. This is a great solutions for users who liked the 'swipe to unlock' feature on older devices. iPhone X supports it as well. However, there is also a difference, instead of making from left to right gesture, you will need to move up from the screen bottom, just like you do when you want to return 'Home' of iPhone X. Do I get 'Slide to unlock', if I don't use Face ID? You are right. If you don't use the Face ID option, you'll see the 'Slide to unlock' line again. It is a bit different, taking into consideration the fact that you have to get used to a new gesture from the bottom to the top of the screen. Can Face ID be removed after enabling it? Yes, you can turn this feature off, if you need to. It can be disabled even if you were using it for a while after you've purchased your new iPhone X. It can be disabled completely or temporarily. Use a button press technique. Hold down a volume button with the Power button simultaneously for a couple of seconds. The Power down screen will be enabled. After it appears, release the buttons you were holding. Tap on 'Cancel' to get rid of the Power down screen. Then, you will be able to turn off the Face ID feature. After the screen asking if you want to turn your iPhone off appears, release the buttons. It will indicate that you may disable Face ID temporarily from this screen. Be careful, as holding these buttons can do other actions to your device. 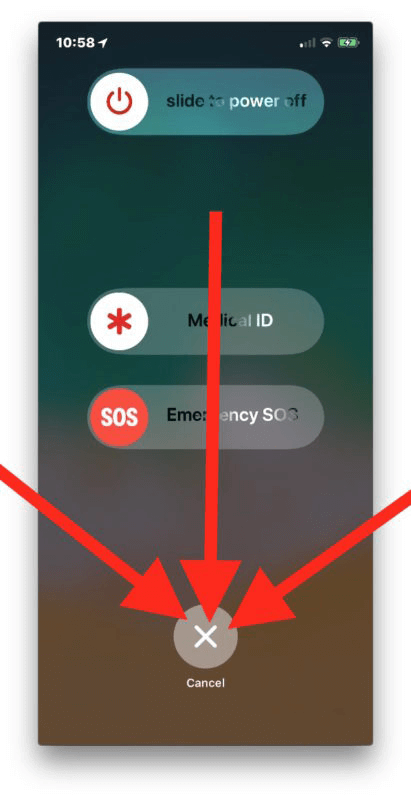 It can take a screenshot, restart your iPhone, trigger a SOS call. So, don't hold them too long, if you don't want an emergency call to be triggered. Can I enable face ID later once again? Of course, you can do it. Even if you skip its initial setup, you may enable it any time you need. Just go to 'Settings' and configure your 'Face ID and passcode' settings. Can I utilize Animoji in case I've disabled Face ID? Yes, you do. Animoji are not tied to Face ID or any other features of your new iPhone X. For those who doesn't know what Animoji is... It is a feature that matches your gestures captured on camera with an onscreen character. It can be done in Messages. You can create brief videoclips with this feature. What will happen if I never use Face ID? quick unlocking an iPhone x by scanning a face. Entering a passcode will surely take a bit more time. using face scanning to making Apple Pay shopping or authenticating any other payments made from your iPhone X. There is no Touch ID in iPhone X, as it was replaced by Face ID. Can someone have access to my iPhone X with disabled Face ID? If they have your passcode, even the registered Face ID won't be a threshold for them. However, if you enable this feature, the scanning process will take place and your iPhone X won't be unlocked for someone else instead of you. Is Face ID safe and secure? Will my data be kept private? I know that many of Apple users don't like the Face ID concept too much, however, the security is much better with it. Apple say that privacy issues have paramount importance for them, and they try to improve all the methods used for keeping iPhones private and safe. In general, we can remember all the concerns regarding Touch ID that took place years ago. You see? Many of us liked this feature, so I am sure that people will get used to Face ID either, and won't have any problems with using it in their everyday life.